If you're looking for a wide variety of activities, mid-American charm and an array of fun and interesting locations then, Ohio is your family vacation destination. Whether you're looking to absorb the culture of the cosmopolitan cities of Cleveland, Cincinnati and Columbus or you're angling for a fishing excursion on Lake Erie, Ohio will over deliver on expectations. Relax on the miles of golden sand beaches of the Lake Erie coast or take in a football game on the Ohio State campus, there is something for everyone here in Ohio. Make memories with your family that they will tell all their friends about and cherish for a lifetime, with a journey to Ohio. Beginning with 16 A-frame rentals and a lodge, Chalets in Hocking Hills has delivered wonderful accommodations and experiences to customers, helping them grow to their current 50 cabin and lodge selection of properties. They are the most recommended and popular rental company in Hocking Hills and it shows in their customer service and high quality properties. At one end of the spectrum you can rent a cozy A-frame cabin that sleeps up to four and is loaded with all the comforts of home. On the opposite end try one of the luxury lodges that sleeps up to 18 and even has an outdoor pool. Pet lovers rejoice because they have special pet friendly cabins available for rental. All rentals are fully furnished and have different amenities for each location. Some of the amenities include full bathroom, fireplace, full kitchen, deluxe bed, flat screen televisions, washer/dryer, hot tub and more. The Hocking Hills area is loaded with indoor and outdoor fun for families regardless of season you choose to visit. Activities include and are not limited to nature hikes through the lush wilderness, zip lining through the green canopy of trees, canoeing on local rivers and lakes or a horseback ride that showcases the beautiful terrain. Don't let your family miss out on the vacation of a lifetime at Chalets in Hocking Hills in Hocking Hills! The town of Logan is not far north of the resort and is a great place to visit. From hot air balloon rides to delicious food, your family will find something they love in Logan. The resort has free internet access to registered guests in the main lobby. In addition you can rent DVD's, stop by the gift shop and make use of the swimming pool and recreation area. Nestled in the beauty of Ohio's Hocking Hills, Cut Above Cabins features the perfect home for your next family vacation. Their selection of lavish cabins to choose feature amenities that will make you feel right at home. Whether you're staying in the Frontier cabin sleeps up to eight people or the Big Pine cabin which can accommodate up to 25, you're guaranteed to indulge in nice furnishings and modern amenities. Explore the wonders of Hocking Hills and visit the Hocking Hills State Park or feel the breeze while you admire the sparkling waters of Cedar Falls. The Ash Cave offers a family-friendly hike with beautiful views. No matter the type of adventure you're looking for, Cut Above Cabins is your home-away-from-home! Visit the Cedar Falls or take a hiking trip through the stunning trails to visit Old Man's Cave or Ash Cave. And if you come during the winter the view of the frozen waterfall is spectacular! Plan a holiday vacation with your whole family and stay with Cut Above Cabins. They have the ideal accommodation for you! Their properties range in size and style. Indulge in modern amenities such as full kitchens, flat-screen television, wireless internet, and fireplaces. No matter if you're here to celebrate Christmas or the Fourth of July, you'll love the scenery and outdoor adventures! Let the lush wooded hills and vibrant natural surroundings be the backdrop for the absolute family vacation at Pine Lakes Lodge. This 11,000 square foot custom log built lodge is the perfect accent to the dense and beautiful wilderness that encompasses the resort. As you enter the resort the theme of rustic luxury dominates the senses. The main room of the lodge is stunning with and ornate antler chandelier, plush furniture, expert carpentry, hand made stone fireplace and rustic themed decor. 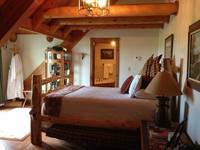 The rustic elegance is extended to each of their five guest suites. No matter which suite you choose, your family will relax in luxury. Amenities include luxury beds, private patios/balconies, sitting areas, full bathroom with Jacuzzi, television with DirecTV and much more. If your family is looking for additional space, there are three fully loaded cabins that reside on the over 550 acre grounds of Pine Lakes Lodge. This is an outdoor lover's paradise and there are activities to match such as fishing the stocked local lakes, hiking the picturesque property, ATV rides, bird watching, horseback trail riding and even horseback riding lessons. Help your family create memories that will last their entire lives with a stay at the Pine Lake Lodge! The resorts offers different deals and packages for hunters. Check with the staff for availability of hunting trip deals and to find out more specifics about the local hunting scene. What better setting for a meting than the lush wilderness of Southern Ohio. Pine Lakes Lodge can accommodate meetings and events up to one hundred people. The Ohio conference room is beautifully decorated and will inspire your guests to have a great meeting. Relaxation and excitement are crucial parts to any family vacation. Let the deluxe accommodations of Hocking Hills Luxury Lodging show you the fusion between have a great experience and being able to rest with ease. Peaking out from the dense woods of the Wayne National Forest, Hocking Hills Luxury Lodging is the ideal place for your family's next getaway. At this management company they pride themselves on their attention to detail and it comes through in their excellent customer service. Each unit endorsed by this property management company is furnished to the highest standards and even comes included with a guaranteed luxury experience. They have lodging at three different locations The Woodford & Booker’s Luxury Cabins, The Lodge at Laurel Run and The Makers Lodges. Each of these locations will redefine your opinion of luxury. They are absolutely loaded with amenities such as plush beds, deluxe bathrooms with granite counters, full kitchens, high end bath supplies and the list goes on and on. Each of the three locations is unique and has their own amenities and onsite perks to enjoy. Some of the activities you can enjoy without leaving the friendly confines are a swimming pool, fitness center, hot tub, movie room, fireplaces, pool table and more. What's a trip to the great outdoors without some time and fun outdoors? Your family has many fun activities to choose from including breathtaking parks, zip line courses, golf courses and nature preserves. While it's hard to find rental locations with constant luxury, Hocking Hills Luxury Lodging delivers time and time again. Bring your family and find out why they are one of the best family vacation spots in Ohio! When they say that luxury is a priority they aren't joking. The properties fall under the classification of "At Home Comfort Luxury Amenities". This mean that the property must maintain a five star rating from multiple sources, provide all the luxury essentials, high caliber customer service and the property must sit on at least 100 acres on expertly landscaped grounds. For the ultimate outdoor wedding look no further than Hocking Hills Luxury Lodging. The resort provides the luxury surroundings and lodging while Cameron Mitchell Premier Events provides the logistics and planning. This combination will provide you with a wedding that no one attending will forget. Tucked away on the lush banks of the Portage River, Erie Islands Resort and Marina is the ultimate location for your next Ohio family getaway. Sitting on 400 acres of waterfront real estate in Port Clinton, Ohio, the resort is centrally located near all the fun attractions and activities in the area. The entire resort was recently renovated, improving upon an already top tier Victorian-style family destination. The accommodations offered will easily handle your families needs regardless of size. They have a beautiful waterfront hotel that features king rooms and luxury suites. If your family is in need of more room, don't worry, the resort has large cottages and high quality vacation homes. Each lodging option is fully furnished and loaded with perks, some of them include comfortable beds, full bathrooms, flat screen televisions and much more. Looking to stay in your RV? 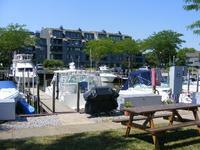 No problem, Erie Islands Resort and Marina has 102 full hookup campsites and 37 sites with partial hookups. Before your family is ready to head out for some fun activities make sure to check out the on site amenities. Stop in at the Dry Dock Store for last minute items and souvenirs or start your day off with a rejuvenating treatment at the Tranquility Salon and Spa. If at any point during your trip your family is feeling hungry, stop by one of eating establishments at the resort: the Harbor View Lounge, Harbor View Grille or the Galley Shanty Snack Shop. With so much to do at the resort your vacation may never leave its lush grounds. Contact them now to make family memories that will last a lifetime! The Port Clinton Area has many great activities for families including African Safari Wildlife Park, Bay Area Bike Rentals, The Berlin Fruit Box Company and Cedar Lanes. Boats are also welcomed at the resort with their 100+ slip marina that can fit vessels up to 40 feet long. For the ideal family getaway, why not choose Cedar Point, Ohio, the self proclaimed “Roller Coaster Capital of the World”. When comes to lodging in Cedar Point look no further than the recently refurbished and historic Hotel Breakers. For over a century, Hotel Breakers has been giving families an upscale place to relax while they enjoy all the fun local activities of Cedar Point. The recent renovation improved almost every aspect of the hotel including a beautifully hand-crafted grand entrance, modernized lobby, renovated public areas and an overhaul of all the guest rooms. While they have made major improvements, the classical architecture, tiffany glass and stunning rotunda still exude the locations rich history. They feature 511 beautiful guest rooms that are fully furnished and include amenities such as comfy beds, wireless internet, kitchenette, full bathrooms and enough room to stretch and relax. Onsite your family will find plenty of fun activities such as indoor/outdoor pools, outdoor water play area, whirlpools, direct access to the beach, game room and much more. In addition to the fun activities the hotel is home to Starbucks, Perkins, TGI Fridays, TOMO Hibachi Grill, Surf Lounge Rotunda Bar, fitness center, shops and conference center. Close to the resort you’ll find out Cedar Point is the “Roller Coaster Capital of the World”. Your family will love Challenge Park, Soak City and Cedar Point Amusement Park. Bring the family and find out why Cedar Point and Hotel Breakers have been attracting people for 110 years. Contact the friend staff to get your next fun family vacation started! According to the United States Census Bureau the population of Sandusky, OH was 25,340 people in 2013. For 146 years Cedar Point has been continuously operating, making it the second oldest constantly running amusement park in North America. When it comes to family vacations that are filled with excitement, activities and lasting memories, Cedar Point Resort stands in the forefront. For almost 150 years Cedar Point Amusement Park has been drawing families to the area.This makes it the second longest continuously running amusement park in North America. For nearly as long, Cedar Point Resort has been providing comfortable and elegant accommodations for guests of all ages. They feature over 1,000 different rooms that encompass a wide variety of styles, sizes, locations and amenities. All rooms are fully furnished, tastefully decorated and have most or all the comforts of home. 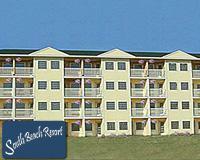 Amenities include quality beds, soft linens, TV’s, full bathrooms, space to relax, views of the ocean and much more. When it come to onsite activities for your family Cedar Point Resort comes through with outdoor water parks, indoor/outdoor pools, arcades, game rooms and more without leaving the resort. When you decide to venture out Cedar Point is a paradise for kids of all ages and adults looking to get in touch with their younger selves. From mini golf at Cedar Point Challenge Golf to seeing dinosaurs at Dinosaurs Alive there is something for every family. Get in touch with their friendly and knowledgeable customer service staff to plan your family's next fun excursion! The readers of Amusement Today have ranked Cedar Point Amusement Park as the number one amusement park in the world for 16 years straight. There is ample space for meetings and conferences at Cedar Point Resort. The fun atmosphere of the surrounding attractions will provide a great break from any meeting. Get in touch with the staff to being planning your next conference or event. Whether you're looking for peaceful privacy or insane fun, South Beach Resort has it in abundance! Both the spacious hotel rooms and the quaint cottages are superb ways to stay, and both feature a bevy of amenities you'd only expect from a luxury resort. Get settled in, then take your family on a whirlwind tour of fun and excitement! South Beach Resort is ideally located near all of the best Lake Erie attractions like Put-in-Bay, Kelley's Island, and Cedar Point. The nearby lakeside towns of Marblehead, Port Clinton and Sandusky are filled with charm, while the naturally-inclined won't want to part from their exceptional view of Sandusky Bay and Lake Erie. The hotel is 2.1 miles from Myrtle Beach International Airport and 2.3 miles from Family Kingdom amusement park. Other amenities include a game room, a fitness room, a sauna, BBQ grills and a business center. Located in the heart of Ohio’s Amish country, Berlin Grande Hotel has large high quality rooms that will have your family feeling right at home. Right outside the upscale town of Berlin, OH, you’ll find the spacious and relaxing confines of the Berlin Grande Hotel. Looking out over the beautiful town of Berlin and in the middle of the lush countryside, the hotel provides stunning views and unparalleled comfort. They have 78 deluxe suites that are all fully furnished and designed to have your family feeling comfortable as soon as you walk in the door. The suites are designed to be stylish and sophisticated with their modern design and old-world decor and furnishings. Not only does each room have woodwork and items that were fashioned by local craftsman, but they are loaded with amenities that your family will love. Some of the featured amenities are plush bedding for easy sleeping, kitchenette to prepare meals for the family, private deck to soak in the local views and an upgraded bathroom that is full of top tier bath products. In addition to having great rooms they also strive to make your family's experience the best it can be with extra perks like a convenience store, fitness center, laundry facility and an indoor pool. Away from the relaxation and comfort of the hotel, the Berlin area has much to offer families vacationing in the area. Your family will love learning about the Amish culture and you're able to buy their quality handcrafted goods at the local flea market. There is also dining, boutique shops, art galleries and much more. Make your family vacation a memorable one with a stay at Berlin Grande Hotel. Don't forget about the complementary breakfast. Each morning they serve a spread of food that will fill your family up so they can have a fun filled day in the Berlin community. Not only does the Berlin Grande Hotel offer great family accommodations but they are also a great place for a meeting or conference. They have 1,000 square feet of customizable meeting space and a full staff ready to help you with every step of the planning process. Contact them now to get your next unforgettable meeting started. Nestled against the golden sand shores of Lake Erie, Sawmill Creek Resort is an ideal family oasis! Located in Ohio’s biggest tourist region, Sawmill Creek Resort is the perfect location for the ultimate family excursion. You're welcomed to the resort by the calming waters of Lake Erie and the 235 lush acres of trees and landscaping that surround the resort. The resort is an all-inclusive haven for families and it features an 18-hole golf course, restaurants, shops and a full service marina. In addition the activities on site are numerous and include activities like biking (rentals available), fishing charters, kayaking (rentals available), jet skiing (rentals available), Lake Erie Cruises and indoor/outdoor swimming pools. The rooms you can rent range from a deluxe guest rooms up to a luxurious two-room fireplace suite with a Jacuzzi. All the rooms are fully furnished and tastefully decorated to help you feel right at home. Amenities vary between rooms but include items such as robes, fine linens, refrigerators, sleeper sofas, large beds, fireplaces and much more. Contact the helpful and friendly staff to make your reservation now for the family getaway of a lifetime! Take a trip to Kelley's island while you're staying at Sawmill Creek Resort. This is the largest American island on Lake Erie. It features multiple high end restaurants and wineries. Sawmill Creek Resort is a great place for a meeting or conference. They feature over 50,000 square feet of indoor and outdoor meeting spaces. rooms can be customized to fit your specific needs. Get in touch with the experienced staff and find out how they can make your next meeting unforgettable. If your ideal family vacation involves postcard like vistas, tranquil surrounding and privacy, then the peaceful accommodations of Sunset Ridge Log Cabins is for you. Being tucked away in the beautiful expanse of wilderness known as the Ohio Amish country, Sunset Ridge Log Cabins offers families like yours a peaceful setting to create memories that will last a lifetime. No matter your reason for your family visiting the area, the cabins available will impress and over deliver on expectations. You can choose between their two full furnished and amenity rich cabins. Having two cabins gives Sunset Ridge the ability to focus directly on the experiences of their customers and provide extra amenities within each cabin. Each rental exudes rustic elegance and include items such as a full bathroom with shower, deluxe towels and linens, comfortable beds, seasonal pool, hot tub, full kitchen with everything you need for meal prep and absolutely breathtaking views of the surrounding vegetation and wildlife. Each of the cabins are clean, expertly maintained and provide the ideal location for your family to get away from it all. If you're looking for some fun activities head out on the local trails for hiking, biking, photography, nature watching and more. The town of Danville is only a 10 minute drive north of the cabin and offers dining options, live entertainment and shopping opportunities. 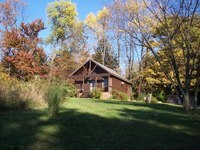 Make your next family getaway a peaceful and entertaining one and stay with Sunset Ridge Log Cabins. Danville is also known as "The Gateway to Amish Country". Not only is this a great location for a family vacation, the cabins are also great for a honeymoon or a secluded romantic couples getaway. Escape to the Guggisberg Swiss Inn with the whole family and soak up the tranquility and beauty of Ohio’s Amish Country. Stay in one of the twenty-four beautifully decorated rooms of Guggisberg Swiss Inn, all of which come with free wireless internet, a mini refrigerator, and a flat screen television. The inn is located in the heart of Ohio’s Amish Country between Millersburg and Berlin. Guggisberg overlooks the Ohio Amish Country’s Holmes County Doughty Valley, guaranteeing that each room features breathtaking views of the farmland. Amish Country Riding Stable is on the premise and features Western style riding. Bask in the beauty of the area by taking a 45-minute long horseback ride around the surrounding farmlands. Families will enjoy seeing the horses grazing around the property and feeding the ducks in the pond. The Population of Millersburg, Ohio is 3,180. Every morning you can treat yourself to their hot breakfast that features staple dishes including ham, bacon, egg blossoms, potato casserole, biscuits and gravy, fresh cinnamon rolls and muffins, and much more.